Sparkle and Shine: pucker up! Today is kind of a gloomy day and I think of the best things to do to cheer yourself up on a gloomy day is to smile. Soo I thought I would devote today's blog on how to get your best smile! I think that the most important aspect of a perfect smile is the lips. Some people think that teeth are more important but even crooked teeth can make a glam smile. There are plenty of celebs out there rockin the crooked teeth.... no body is rockin bad lips. So I thought I would share my tips on how to get a perfect pucker!!!!!!! - One of the most important aspects to having a perfect pucker is to get smooth lips. There are two parts to smooth lips. First to exfoliate then to moisturize. There are a billion different products out there that you can buy that will exfoliate your lips but I'm always looking for an at-home cheap alternative and there is a great one for this! After you exfoliate you need to follow up with a moisturizer. It is very tempting to turn to one of the cooling or smell good balms you buy at the store but in reality these products can really dry out your skin. I had some trouble with my lips a couple of months ago and when I asked my doctor he warned me against all balms and instructed me to use a product that I thought was pretty random but now I swear by. VASELINE. I have little jars of the stuff everywhere. It is the perfect moisturizer because it seals all the moisture in without trying to insert any sort of chemical into your lips. Also it's dirt cheap and super easy to find. - another important part of perfect pucker is color. I am a big fan of gloss. I don't really like lipstick just because it really drys out my lips and I feel like sometimes the pigment can be a little overwhelming on my particular face. I therefore am addicted to glosses of all kinds. One in particular I am loving right now is by Covergirl. 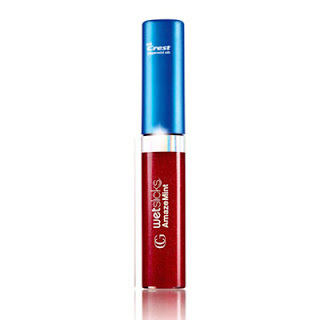 Its called CoverGirl WetSlicks AmazeMint in Red Riot. This is one of the prettiest colors of gloss I have ever seen. The red lip is really in for spring and its also a really classic look but sometimes I feel like I look like a clown when I wear a bright red lip. This red is perfect because it slightly translucent so the pigmentation is a little less overwhelming but it does still pop. Plus as an added bonus this gloss had crest peppermint oil in it so that while you wear it, it is also freshening your breath! -A little trick that I like to improve your smile is to play up your cupids bow. Your cupids bow is the little dip in the middle of your top lip. If you accent your Cupid's bow you can make your lips look much fuller. The way to do this is outline your Cupid's bow with a highlighter so that it reflects light and draws attention. There are lots of different things you can use, but my personal favorite is a gold eyeliner. Simply trace along your lip line with the eyeliner pencil (liquid will work too) not going too far past your Cupid's bow. Then blend the line in a little with your ring finger and voila! I hope these tips can help everyone get the glam grin they deserve! Lets all smile the clouds away!